ROSEMONT, Ill., /PRNewswire/ -- The average walker takes about 10,000 steps per day, which can put tremendous stress on the 26 bones and 33 joints in your feet. 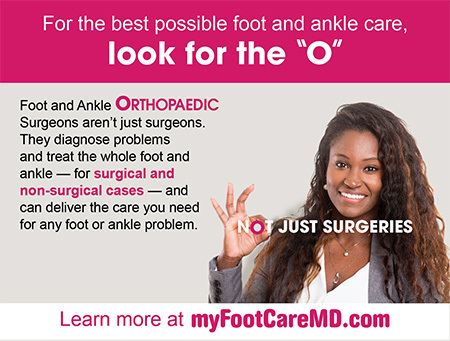 The Look for the "O" campaign from the American Orthopaedic Foot & Ankle Society (AOFAS) encourages consumers to take charge of their foot and ankle health and choose a foot and ankle orthopaedic surgeon when medical care is needed. "Most people don't give much thought to their foot health – that is, until something goes wrong," stated J. Chris Coetzee, MD, president of the AOFAS Board of Directors. "But 75% of all people experience foot pain at some point in their lives, and it's important to know how to find the best medical care before a problem arises." Foot and ankle orthopaedic surgeons are medical doctors (MD and DO) who specialize in diagnosing and treating disorders of the musculoskeletal system, specifically in the bones, joints, ligaments, muscles, tendons, and nerves in the feet and ankles. No other healthcare provider has the depth and breadth of experience to treat the full spectrum of foot and ankle injuries and diseases. To ensure optimal foot health, foot and ankle orthopaedic surgeons recommend examining your feet on a weekly basis. Look for changes in appearance such as swelling, discoloration, or changes to the shape of your feet. Also check for normal circulation, sensation, function, and any pain. If you discover anything unusual, schedule an appointment with a foot and ankle orthopaedic surgeon near you. Why choose a foot and ankle orthopaedic surgeon? Training – Foot and ankle orthopaedic surgeons complete four years of medical school and five years of residency training in orthopaedic surgery. Following residency, they complete an additional one-year advanced fellowship training program focused on foot and ankle care. Expertise – Foot and ankle orthopaedic surgeons treat a broad range of foot and ankle conditions, from common problems like bunions and plantar fasciitis, to traumatic injuries, complex deformities, and arthritis. Consult with a foot and ankle orthopaedic surgeon before beginning any foot or ankle treatment, particularly if surgery is advised. Patient Care – With their comprehensive medical training, foot and ankle orthopaedic surgeons address foot and ankle problems in relation to your full body health. They diagnose problems and determine the best treatment options for both surgical and non-surgical cases. 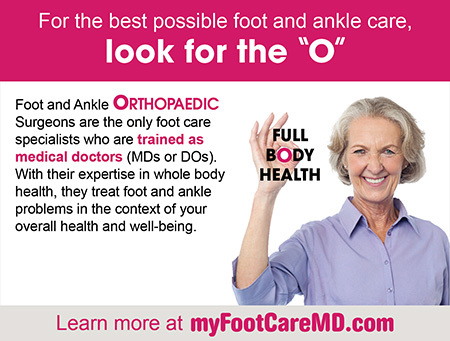 Stay informed about your foot and ankle health and find a foot and ankle orthopaedic surgeon in your area at myFootCareMD.org.